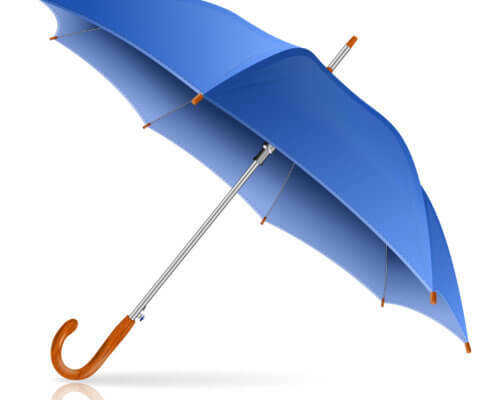 Do you have an umbrella insurance policy? If not, you probably should. An umbrella insurance policy is an affordable way to increase your liability coverage. Liability coverage protects you from the losses you could face by being sued. Usually liability coverage pays from the defense costs and judgement levied against you due to damages you cause to others. Unfortunately we live in a world where the number of lawsuits are steadily increasing, and the judgement are increasing. This creates the need for umbrella policies. An umbrella insurance policy is liability coverage that sits over the top of your other policies. Your other policies are called underlying policies, and your umbrella policy will have a minimum requirement of what your underlying policies will be. In many cases this might be $300,000 in liability on your Auto, Homeowners, and other policies. If you are sued and the judgement exceeds the limit on your auto, homeowners, or other policy then the umbrella policy would pick up where the other policy left off. What’s the alternative? Well if your insurance policy limits are exhausted, then they start to look at what assets you have. What kind real estate do you own, what does your bank account look like, what other assets, a boat, and RV, a second home or cabin. Imagine those things disappearing in a lawsuit. That is the reality of a lawsuit without an umbrella. Its easy to get, its affordable, its great coverage! Still not sure, that’s okay, ask us.